By midday, Tuesday, more than 150 cows, including some that belonged to his neighbours in Rangul village, lay dead under unknown circumstances. According to the owners, the deaths began on Monday evening. We have used the same grazing field since time immemorial and we have never witnessed such an incident," said Otieno. He said he discovered his cows had a problem at 10pm when he went to the cowshed to respond to a strange noise from the cattle. "As I moved closer to the cowshed, one cow had already dropped to the ground. Before long another one dropped. We tried to save them but it was not possible. Within 30 minutes, 10 cows had died," said Otieno. "It was a case of one cow collapsing after another, and I counted them as they died. It is sad because this is my only source of livelihood," said Odhiambo. 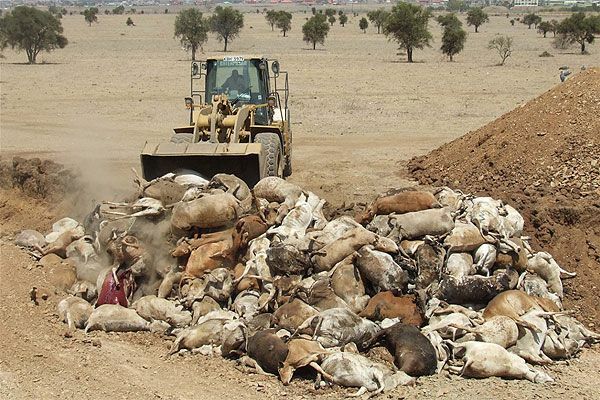 Kisumu Director of Special Programmes Ruth Odinga said they had sent an excavator to help bury the cows.